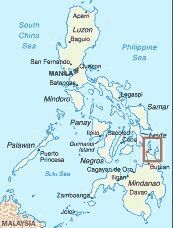 General Luna is situated at the southern tip of the Surigao Islands, province of Surigao del Norte. It is one of the series of islands in the northeastern part of Mindanao. Taken all together, it has a 27 mile long sugar-fine whiter beach, cove so wide that it can literally accommodate thousands of water skiers and wind surfers. It remains placid even during stormy weather. During the dry season (April to October) surfers drove to the big waves outside the cove. Typhoons that hits the upper part of Philippines (average of 26 a year) generates tremendous energy that waves of world class quality pound he northeastern portion of the town where the famous "Cloud 9" is located. There are 7 other surfing areas of world class quality in the town of Gen. Luna. In the same summer months, marlin, yellow fin, tuna, sailfish dorado, wahoo and other big game fishes abound the area, Its crystalline waters are so clean and pure that you can see schools of fish ten fathoms deep. Kayaking and sailing are also the favorite past time of nature lovers who probes the hundred off inlets and hidden coves not only in General Luna but all of Siargao Islands. During the monsoon season, the surf goes so big that only the intrepid and big-hearted surfers dare to ride "Cloud 9". Most settle on the other surfing areas, In the cove however, because of the almost steady blowing of the monsoon wind, wind-surfers have a field day, This and a lot more awaits you in General Luna.